Once a consistent 150,000-unit seller, with a peak of 177,919 in 2006, the Odyssey's new annual target is 110,000. SAN DIEGO -- The minivan segment may be in a swoon, but that isn’t stopping Honda from going all-in with its latest Odyssey. “This is not your ordinary kid or cargo hauler,” said John Mendel, American Honda Motor Co. executive vice president. 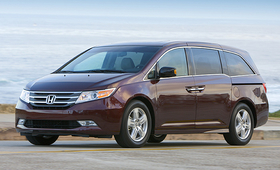 The Odyssey is the top-volume nameplate in the minivan segment, although the Dodge Grand Caravan and Chrysler Town & Country combine to outsell it. But the overall health of the segment began plummeting well before the recession hit. U.S. minivan sales passed the million-a-year mark in 1993 and peaked in 2000 at 1.37 million. Then customers started abandoning the segment. In 2008, automakers sold just over 600,000. Last year's tally fell below 450,000. By 2014, Mendel hopes, the segment will have returned to about 650,000 sales, but he isn’t holding out for much growth beyond that. That’s a big reason for a conservative volume estimate for the Odyssey. Once a consistent 150,000-unit seller, with a peak of 177,919 in 2006, the Odyssey’s new annual target is 110,000. But the combination of Gen X and Gen Y families vastly outnumbers the baby boomer demographic that once fueled the original minivan boom. That leads Odyssey chief engineer Art St. Cyr to hope for a better future for the segment. Gen X and Gen Y are likely to embrace family life and minivans -- Gen X because they were mostly latchkey kids, Gen Y because they seek closer family relationships, St. Cyr said. Despite what might be an upward trend in minivan intenders, Honda also will market aggressively to “hesitators,” those who should buy a minivan but buy a crossover instead. The Odyssey goes on sale Oct 1.